Robert Dennis Harris (born 7 March 1957) is an English novelist. He is a former journalist and BBC television reporter. Although he began his career in non-fiction, his fame rests upon his works of historical fiction. Beginning with the best-seller Fatherland, Harris focused on events surrounding the Second World War, followed by works set in ancient Rome. His most recent works centre on contemporary history. Harris was educated at Selwyn College, Cambridge, where he was president of the Union and editor of the student newspaper Varsity. from the BBC programme Desert Island Discs, 28 November 2010. Born in Nottingham, Harris spent his childhood in a small rented house on a Nottingham council estate. His ambition to become a writer arose at an early age, from visits to the local printing plant where his father worked. Harris went to Belvoir High School in Bottesford, and then King Edward VII School, Melton Mowbray, where a hall was later named after him. There he wrote plays and edited the school magazine. 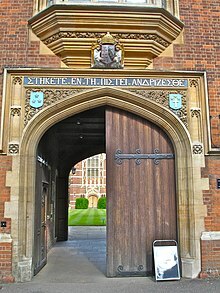 Harris read English literature at Selwyn College, Cambridge. While at Cambridge, Harris was elected president of the Cambridge Union and editor of the oldest student newspaper at the university, Varsity. After leaving Cambridge, Harris joined the BBC and worked on news and current affairs programmes such as Panorama and Newsnight. In 1987, at the age of thirty, he became political editor of The Observer. He later wrote regular columns for the Sunday Times and the Daily Telegraph. Harris's first book appeared in 1982. A Higher Form of Killing, a study of chemical and biological warfare, was written with fellow BBC journalist Jeremy Paxman. Other non-fiction works followed: Gotcha! The Government, the Media and the Falklands Crisis (1983), The Making of Neil Kinnock (1984), Selling Hitler (1986), an investigation of the Hitler Diaries scandal, and Good and Faithful Servant (1990), a study of Bernard Ingham, Margaret Thatcher's press secretary. Harris's million-selling alternative-history first novel Fatherland has as its setting a world where Germany has won the Second World War. Publication enabled Harris to become a full-time novelist. HBO made a film based on the novel in 1994. Harris stated that the proceeds from the book enabled him to buy a house in the country, where he still lives. His second novel Enigma portrayed the breaking of the German Enigma code during the Second World War at Cambridge University and Bletchley Park. It went on to become a major film film, with Dougray Scott and Kate Winslet starring and with a screenplay by Tom Stoppard. Archangel was another international best seller. It follows a British historian in contemporary Russia as he hunts for a secret notebook, believed to be Stalin's diary. In 2005 the BBC made it into a mini-series starring Daniel Craig. In 2003 Harris turned his attention to ancient Rome with his acclaimed Pompeii. The novel is about a Roman aqueduct engineer, working near the city of Pompeii just before the eruption of Vesuvius in 79 AD. As the aqueducts begin to malfunction, he investigates and realises the volcano is shifting the ground and damaging the system and is near eruption. Meanwhile, he falls in love with the young daughter of a powerful local businessman who was illicitly dealing with his predecessor to divert municipal water for his own uses, and will do anything to keep that deal going. He followed this in 2006 with Imperium, the first novel in a trilogy centered on the life of the great Roman orator Cicero. Harris was an early and enthusiastic backer of British Prime Minister Tony Blair (a personal acquaintance) and a donor to New Labour, but the war in Iraq blunted his enthusiasm. "We had our ups and downs, but we didn't really fall out until the invasion of Iraq, which made no sense to me," Harris has said. In 2007, after Blair resigned, Harris dropped his other work to write The Ghost. The title refers both to a professional ghostwriter, whose lengthy memorandum forms the novel, and to his immediate predecessor who, as the action opens, has just drowned in gruesome and mysterious circumstances. The dead man has been ghosting the autobiography of a recently unseated British prime minister called Adam Lang, a thinly veiled version of Blair. The fictional counterpart of Cherie Blair is depicted as a sinister manipulator of her husband. Harris told The Guardian before publication: "The day this appears a writ might come through the door. But I would doubt it, knowing him." Harris said in a U.S. National Public Radio interview that politicians like Lang and Blair, particularly when they have been in office for a long time, become divorced from everyday reality, read little and end up with a pretty limited overall outlook. When it comes to writing their memoirs, they therefore tend to have all the more need of a ghostwriter. Harris hinted at a third, far less obvious, allusion hidden in the novel's title, and, more significantly, at a possible motive for having written the book in the first place. Blair, he said, had himself been ghostwriter, in effect, to President Bush when giving public reasons for invading Iraq: he had argued the case better than had the President himself. The New York Observer, headlining its otherwise hostile review The Blair Snitch Project, commented that the book's "shock-horror revelation" was "so shocking it simply can't be true, though if it were it would certainly explain pretty much everything about the recent history of Great Britain." The second novel in the Cicero trilogy, Lustrum, was published in October 2009. It was released in February 2010 in the US under the alternative title of Conspirata. His novel The Fear Index, focusing on the 2010 Flash Crash, was published by Hutchinson in September 2011. It follows an American expat hedge fund operator living in Geneva who activates a new system of computer algorithms that he names VIXAL-4, which is designed to operate faster than human beings, but which begins to become uncontrollable by its human operators. An Officer and a Spy is the story of French officer Georges Picquart, a historical character, who is promoted in 1895 to run France's Statistical Section, its secret intelligence division. He gradually realises that Alfred Dreyfus has been unjustly imprisoned for acts of espionage committed by another man who is still free and still spying for the Germans. He risks his career and his life to expose the truth. Dictator is the long-promised conclusion to Harris's Cicero trilogy. It was published by Hutchinson on 8 October 2015. Conclave, published on 22 September 2016, is a novel "set over 72 hours in the Vatican", preceding "the election of a fictional Pope." His latest novel, published on 21 September 2017, is a thriller set during the negotiations for the 1938 Munich Agreement between Hitler and UK Prime Minister Neville Chamberlain. The story is told through the eyes of two young civil servants - one German, Hartmann, and one English, Legat, who reunite at the fateful summit, six years after they were friends at university. In an interview on the BBC's The Andrew Marr Show on 24 June 2018 Harris stated that his next novel, due in 2019, would be set in the future. It will be published by Hutchinson on 22 August 2019. In 2007, Harris wrote a screenplay of his novel Pompeii for director Roman Polanski. Harris acknowledged in many interviews that the plot of his novel was inspired by Polanski's film Chinatown, and Polanski said it was precisely that similarity that had attracted him to Pompeii. The film, to be produced by Summit Entertainment, was announced at the Cannes Film Festival in 2007 as potentially the most expensive European film ever made, set to be shot in Spain. Media reports suggested Polanski wanted Orlando Bloom and Scarlett Johansson to play the two leads. The film was cancelled in September 2007 as a result of a looming actors' strike. Polanski and Harris then turned to Harris's bestseller, The Ghost. They co-wrote a script and Polanski announced filming for early 2008, with Nicolas Cage, Pierce Brosnan, Tilda Swinton and Kim Cattrall starring. The film was then postponed by a year, with Ewan McGregor and Olivia Williams replacing Cage and Swinton. The film, retitled The Ghost Writer in all territories except the UK, was shot in early 2009 in Berlin and on the island of Sylt in the North Sea, which stood in for London and Martha's Vineyard respectively, owing to Polanski's inability to travel legally to those places. In spite of his incarceration, he oversaw post-production from his house arrest and the film premiered at the Berlin Film Festival in February 2010, with Polanski winning the Silver Bear for Best Director award. Harris and Polanski later shared a César Award for Best Adapted Screenplay. Harris was inspired to write his novel An Officer and a Spy by Polanski's longtime interest in the Dreyfus affair. He also wrote a screenplay based on the story, which Polanski was to direct in 2012. The screenplay was first titled D, after the initial written on the secret file that secured Dreyfus' conviction. After many years of production difficulties, it started filming in November 2018 as J'accuse, starring Jean Dujardin and co-starring Mathieu Amalric and Olivier Gourmet. It is produced by Alain Goldman and will be distributed by Gaumont. In June 2018 Harris reiterated his support for Polanski, and branded criticisms of Polanski's crimes as being a problem of culture and fashion "The culture has completely changed...And so the question is: "Do you then say, OK fine, I follow the culture.' Or do I say: 'Well, he hasn't done anything since then. He won the Oscar, he got a standing ovation in Los Angeles.' The zeitgeist has changed. Do you change with it? I don't know, to be honest with you. Morally, I don't see why I should change my position because the fashion has changed." Harris has appeared on the BBC satirical panel game Have I Got News for You in episode three of the first series in 1990, and in episode four of the second series a year later. In the first he appeared as a last-minute replacement for the politician Roy Hattersley. He made a third appearance on the programme on 12 October 2007, seventeen years, to the day, after his first appearance. Since the gap between his second and third appearance was nearly 16 years, Harris enjoyed the distinction of the longest gap between two successive appearances in the show's history until Eddie Izzard appeared on 22 April 2016, 20 years after his appearance on Episode 1 of Series 11 (19 April 1996). On 2 December 2010, Harris appeared on the radio programme Desert Island Discs, when he spoke about his childhood and his friendships with Tony Blair and Roman Polanski. Harris appeared on the American PBS show Charlie Rose on 10 February 2012. Harris discussed his novel The Fear Index which he likened to a modern-day Gothic novel along the lines of Mary Shelley's Frankenstein. Harris also discussed the adaptation of his novel, The Ghost that came out as the movie, The Ghost Writer directed by Roman Polanski. Harris was a columnist for the Sunday Times, but gave it up in 1997. He returned to journalism in 2001, writing for the Daily Telegraph. He was named "Columnist of the Year" at the 2003 British Press Awards. Harris lives in a former vicarage in Kintbury, near Newbury, Berkshire, with his wife Gill Hornby, herself a writer and sister of best-selling novelist Nick Hornby. They have four children. Harris contributed a short story, "PMQ", to Hornby's 2000 collection Speaking with the Angel. Formerly a donor to the Labour Party, he renounced his support for the party after the appointment of Guardian journalist Seumas Milne as its communications director by leader Jeremy Corbyn, tweeting: "Council house born. Comprehensive-school educated. Voted Foot, Kinnock. But not for private-school apologists for IRA and Stalin. Sorry". He now supports the Liberal Democrats. ^ "Robert Harris". Desert Island Discs. 28 November 2010. BBC Radio 4. Retrieved 18 January 2014. ^ Curtis, Nick (18 September 2013). "Battle of the blokebusters: William Boyd v Robert Harris". Evening Standard. Retrieved 20 February 2018. ^ Harris, Robert. "Robert Harris: 'The Ghost' of Tony Blair". NPR. Retrieved 9 December 2015. ^ Anthony Holden. "Review: The Ghost by Robert Harris". The Guardian. Retrieved 9 December 2015. ^ Edemariam, Aida (27 September 2007). "Aida Edemariam talks to author Robert Harris". The Guardian. London. ^ National Public Radio interview, 31 October 2007. ^ "Richard and Judy ask Robert Harris". W H Smith. Archived from the original on 19 October 2014. Retrieved 22 April 2015. ^ Robert Harris. Dictator. Amazon.co.uk. ISBN 9780091752101. Retrieved 9 December 2015. ^ results, search (22 September 2016). "Conclave: The bestselling Richard and Judy Book Club thriller". Hutchinson. Retrieved 6 May 2018 – via Amazon. ^ Robert Harris [@Robert___Harris] (25 March 2016). "It's called Conclave. Set over 72 hours in the Vatican. The election of a fictional Pope..." (Tweet) – via Twitter. ^ Beard, Matthew (3 February 2007). "Polanski to bring best-seller on last days of Pompeii to the big screen | News | Culture". The Independent. Retrieved 9 December 2015. ^ Dave McNary; Alison James; Dade Hayes (11 September 2007). "Polanski pulls out of 'Pompeii'". Variety. Retrieved 9 December 2015. ^ Andrew Anthony (24 September 2013). "Robert Harris: 'Whenever a crowd is running one way, I run the other'". The Guardian. Retrieved 9 December 2015. ^ McClintock, Pamela (9 May 2012). "Roman Polanski to Direct Dreyfus Affair Drama 'D'". The Hollywood Reporter. ^ AlloCine. "J'accuse : Jean Dujardin chez Roman Polanski pour son film sur l'affaire Dreyfus". AlloCiné. ^ "Robert Harris says he won't change position on Roman Polanski 'because the fashion has changed'". Independent.co.uk. ^ "Episode 3, Series 51, Have I Got News for You - BBC One". BBC. Retrieved 6 May 2018. ^ "Episode 1, Series 11, Have I Got News for You - BBC Two". BBC. Retrieved 6 May 2018. ^ "Robert Harris joins". Daily Telegraph. 8 September 2001. Retrieved 9 December 2015. ^ Rayner, Gordon (23 October 2015). "Exclusive: Jeremy Corbyn's millionaire spin doctor Seumas Milne sent his children to top grammar schools". Retrieved 6 May 2018 – via www.telegraph.co.uk. ^ "Robert Harris on Donald Trump, Theresa May and the new super-elite". Wikimedia Commons has media related to Robert Harris (writer).